that, offering what you have given, we may win you yourself. That's my translation. Maybe someone can post how the English really goes (I don't have an English missal here) and we can see how close I got. That 'glorious exchange' is the joy of Christmas. We who have so little to give receive a gift greater than we can contain or comprehend: God himself. In the mystery of the Incarnation, God abandons his divinity into our humanity, lifting it into the mysterious inner life of the Blessed Trinity himself. This is the gift of which St. John speaks in the Gospel of Christmas Day: "But to all who received him, who believed in his name, he gave the power to become children of God; who were born not of blood nor of the will of the flesh nor of the will of man, but of God." (John 1:12-13) Our rebirth in God becomes available through the birth of the Word of God as one of us. When we realize the depth and greatness of the gift we have received in Jesus Christ, no response makes sense but to give ourselves totally to him. Our giving of ourselves to God remains a gift ever meager and poor; God's gift of himself to us remains ever greater than we can think or imagine. As St. Francis puts it in the Letter to the Entire Order, "Hold back nothing of yourselves for yourselves, that He Who gives Himself totally to you may receive you totally." and then formed man and woman in his own image. as a sign of the covenant. in the sixty–fifth week according to the prophecy of Daniel. was born in Bethlehem of Judea of the Virgin Mary. This house is born for us in the divine humanity of Jesus Christ. This humanity will grow and teach and heal and suffer and finally die on the Cross, drawing into himself all the suffering we have brought upon ourselves and each other with our sins. But by the power of his divinity this sacred humanity is raised from the dead, raised into the sacraments that make a people into a Church, into the mystical Body of the Risen Christ. Baptized into the death and Resurrection of Jesus Christ and becoming his Body and Blood that we receive in the holy Eucharist, we are the spiritual house God promised to David in an everlasting covenant. As the Body of Christ, as Church, we become the presence of Jesus, teaching, healing, reconciling, and finally accepting the Cross with the faith that the divine humanity of Christ has blazed a trail through our suffering to the new life of the Resurrection. So his birth is our rebirth as the resurrected humanity that is his mystical Body. The beginning of the love of God is the awareness of having been loved by God, loved into existence by the will of God and preserved in being from moment to moment by the love of God. In truth, God's love for us and our love of God end up being the same thing, for our love of God is the work of the Holy Spirit within us. The whole process is just that; the procession of the Holy Spirit from the Father and the Son as it comes to live in us by baptism and faith. Loving God is the beginning of the awareness of the love God has for us. This awareness bears further fruit in the continuing realization that we ourselves and everybody else and indeed the whole of creation is, in a sense, made out of love, coming into existence as it all does through the Word that is the Beloved proceeding from the Love that is the Source of all that is. Realizing this love as the innermost identity of every creature, we begin to see our neighbor and the creation around us as not only lovable, but as something that demands love if it is to be truly appreciated and understood. This is how the love of God turns into the love of neighbor; when we realize that our neighbor has a demand on our love--if we are to truly love the love with which God creates--especially our neighbor for whom the awareness of the love of God may be obscured by the suffering and poverty that are the fruit of human sin. The other week I was translating for a meeting and one of the things I got to enjoy was a presentation on the Lower Basilica of St. Francis in Assisi. 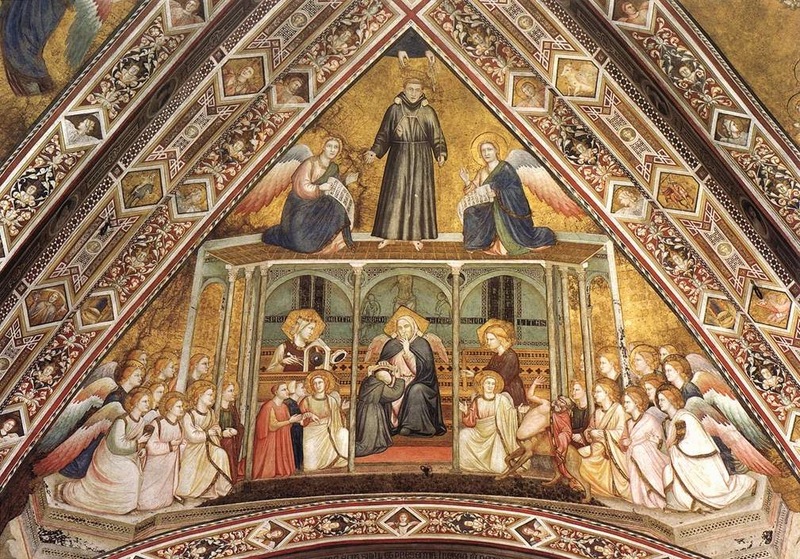 The presenter spent some good time on the allegories of obedience, poverty, and chastity that surround the scene of the glorified Francis above the altar. I confess that even though these allegories--in black and white reproduction--adorned the walls outside of my room when I was in post-novitiate formation, I guess I never studied them in much detail. The new creation was growing and gathering strength within the old creation long before it was definitively inaugurated at the beginning of these last days in the Resurrection of Jesus Christ. It was the power of this new creation that brought forth the patriarch Isaac from Abraham and Sarah, even though Abraham's body was "as good as dead" and Sarah was barren. (Romans 4:19) In them we begin to see the first light of the Resurrection. As I sat down in chapel this morning I found myself praying for the United States. Praying for the wisdom to know the paths toward justice and reconciliation, and for the courage to follow them. What other strong statement can I make about our current events? Each one that I think of seems infected by a, 'yes, but also this...' And this from someone who grew up acutely aware of our issues of race; in fact, the first time I found myself in a majority white environment was when I went away to college, and this was such a culture shock that I only managed to resolve it by ending up a Catholic at the end of it all. But the frustration and not knowing what to say--from my position of white privilege (and also white guilt)--is nothing new to me. It's akin to the frustration that also left me, at the end of college, wanting to be a Franciscan. It first came most strongly when the euphoria of having done good in some work of charity gave way to the realization that even this was tainted by the superiority of my social position. To me, to become a Franciscan meant that at least in my own person, I could undo the systems of power and privilege that gave some people in society access to resources and others not. That made some rich and kept others poor. That led to me enjoying a hedonistic college campus while certain of my contemporaries had to go die in Iraq. (Such was the historical moment of my conversion-crisis). St. Francis showed me a way to opt out of the system from which came so much hurt and injustice. Has it worked out? Has my Franciscan journey done this for me? That's another post, I think. God grant me the courage to write it if the inspiration comes. I've come to love Advent more and more. Especially the beginning when the readings and prayers make it clear that we're not yet 'preparing for Christmas' but looking forward in hope to the coming of the Lord in glory. Advent invites us to contemplate the in-between-ness of our existence, living as we do after the first coming of Jesus Christ and before the second. But we don't push this dichotomy too far, for in our spiritual life, our mystical life, the incarnation of the Word and the parousia of Jesus Christ turn out to coincide; the Bridegroom of our souls is always arriving by grace. That's why Jesus in the Gospel we have this year for the first Sunday of Advent exhorts us to "Be watchful! Be alert!" (Mark 13:33) By quiet prayer we cultivate a watchfulness, a mindfulness in our minds and hearts, so that we may notice the graces our daily lives present to us, the graces that Providence puts in our path at each moment.